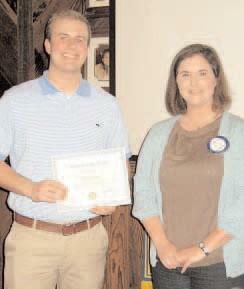 The Brook Hill School’s Student of the Month for February, presented by the Bullard Rotary Club, has been named Mason Jones. Jones, a senior at Brook Hill, is the son of Dr. Mark and Dr. Rebecca James and has two brothers, named TJ and Grant. He is a member of National Honor Society, the state- champion Brook Hill Guard football team and the baseball team’s announcer. Jones has been awarded the Headmaster’s honor guard throughout all four years at the Brook Hill Upper School, and also was an all- district defensive end. In his free time, Jones said he spends time with family and friends, his church youth group and student choir and plays sports. After graduating from Brook Hill, he plans to attend Baylor University, majoring in business marketing, and hopes to attend law school after college.